YAY, I got my new Verve! I was debating which set to get, then I just decided to get the whole new release : ) I can't resist my Verve lol! I made this for today's Color Challenge on SCS and for this week's Mojo Monday sketch. The CC was to use Real Red, Old Olive, and Basic Black. I stamped the floral sprig from the set Because of You with Old Olive. I stamped the individual flowers with Memento Tuxedo Black, and colored them in with the red. I stamped the butterfly from the set Beautiful Kindness onto some dp from SU Summer Picnic DSP. I added some stitching, and some paper piercing and it was pretty much complete! Thank you so much for stopping by! Kerri is a really gorgeous card! I love it! You nailed both the color and sketch challenges perfectly! Show me more verve please, show me more verve! You just got it? 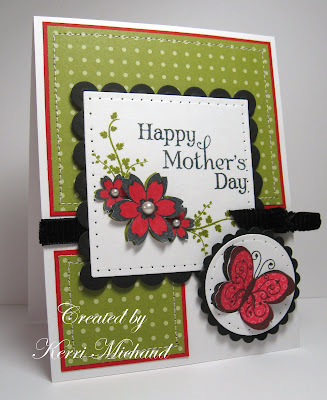 I love the colors you have on this card...not your traditional Mother's Day colors and I think it's very pretty. That ribbon action you've got goin' on is crazy HOT! There is somthing wrong wiht the mail adress, the mail comes back to me again and again… You can mail me at marie72591@hotmail.com so can I send you my adress. this card is so beautiful! I love the stamp you chose! Really love how you put the butterfly! and colors... very nice! Love this card, Kerri! Great work-I love the stitching and colors you used! Oh Kerri what a beautiful card! LOVE all the paper piecing and the colors are just beautiful...and I love the stitching too! Drop dead gorgeous Kerri! I love the flowers and the butterfly and how you popped them. The colors are wonderful on this - Love the layered flowers! Very nice choice of colors!